► Make prompt, strategic investment decision with quality data. ► Streamline client, compliance and regulatory reporting. ► Manage counterparty exposure by country, currency and instrument. ► Monitor portfolio deviation for SAA and TAA. ► Capture multiple snapshots of data, thereby supporting timely risk reporting and accurate performance reporting. ► Harmonize source data from different systems and in different formats. ► Address common issues such as classification and country ratings. ► Prebuilt tools to tag proxy securities for selected securities for valuation and classification purposes; thereby simplifying downstream processes, such as data upload into FactSet or BarraOne. ► Scalable to include AUM Analysis and Performance Returns Analysis. ► Prebuilt framework reduces implementation time, effort and risk. ► Improve data integrity and provide a “single point of truth”. ► Eliminate manual processes and errors in report generation. ► Understand the local business environment. ► Provide prompt and personalized local support. ► Committed to working closely with our customers to implement Optimai IDW. ► Experienced in various asset classes and building interfaces to FactSet, BarraOne, RiskMetrics, Bloomberg, and etc. Optimai IDW supports the extraction and upload of static, position and transaction data from various sources including BarraOne, FactSet, and Bloomberg STP/ Gateway. It accepts data via interfaces in various formats including text and excel files. Data loading may be scheduled as an automatic job or triggered by the user. Optimai IDW will be the “single source of truth”. 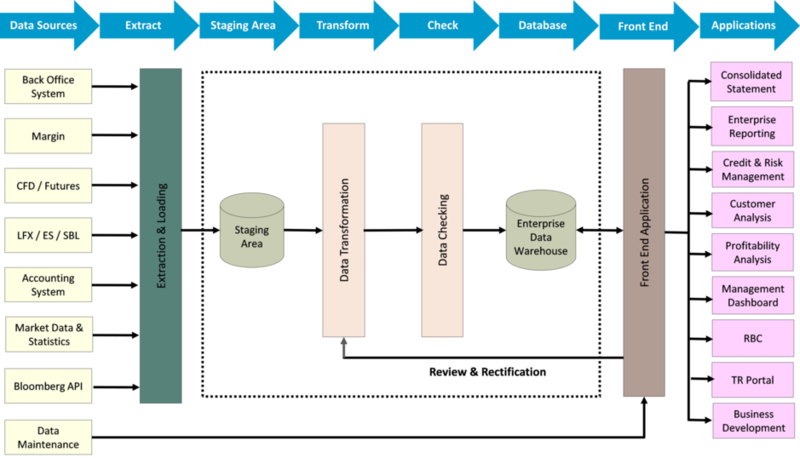 To achieve this, uploaded data must undergo the considerable transformation. Optimai IDW is powered by a flexible data transformation framework that is maintainable and extendable by the customer’s IT team. It may be used to standardize reference data such as currencies and security identifiers from various source systems; tag proxy securities for classification or valuation purpose; perform custom classification of country, sector and rating; customize pricing policy; compute valuation and NAV; as well as perform other analytics. Static, position and transaction data has to be checked for accuracy and completeness before being stored in Optimai IDW. All data shall be subjected to technical and business checking rules. Exception data records will be flagged by the checking rules for review and rectification. The checking rules may be updated from time to time by authorized users, with a proper audit trail of any rectification made. ► Data setup and maintenance module supporting manual data entry or excel upload of information that may not be included in the source data files. Comprehensive features such as maker/checker function and customizable authorization workflow are available. ► Data checking and rectification module supporting the review and rectification of error records that were flagged by the data checking rules, with a proper audit trail of any rectification made. ► Adjustment module supporting the rectification of data that may be incorrectly uploaded, such as exchange rate. ► Proxy securities module supporting the association of securities to proxy securities for valuation and classification purposes. ► Bloomberg lookup module supporting the lookup of missing static and market data via Bloomberg API interface. ► Online enquiry module, a customizable data query tool, to query parameters, transactions and positions. It is excel-like and may be exported to excel. Optimai IDW delivers portfolio and investment analytics; client reporting; compliance and regulatory reporting; as well as customized reports. Our team is experienced in building interfaces for risk (BarraOne), performance (FactSet, Hi-performance) and Bloomberg. An interactive management dashboard and report portal will meet your various reporting requirements. The management dashboard provides users with a holistic view of the investment activities and other key business metrics in both summary and detailed views; with a drill path between them. Data may be presented in charts or tables. As an open system, Optimai IDW also allows you to use your preferred third-party query and reporting tools. Optimai IDW may be extended to include additional functionalities such as customized benchmark returns and aggregation of underlying instruments for Fund of Funds. Related modules for AUM Analysis and Performance Returns Analysis are also available.